Our 16 year old son is going to rural China (Yunnan Province) for 6 weeks as part of a school program called China Fieldwork Summer. He is very excited about the trip (which makes him a better person than me). Beijing was the first stop on our tour. 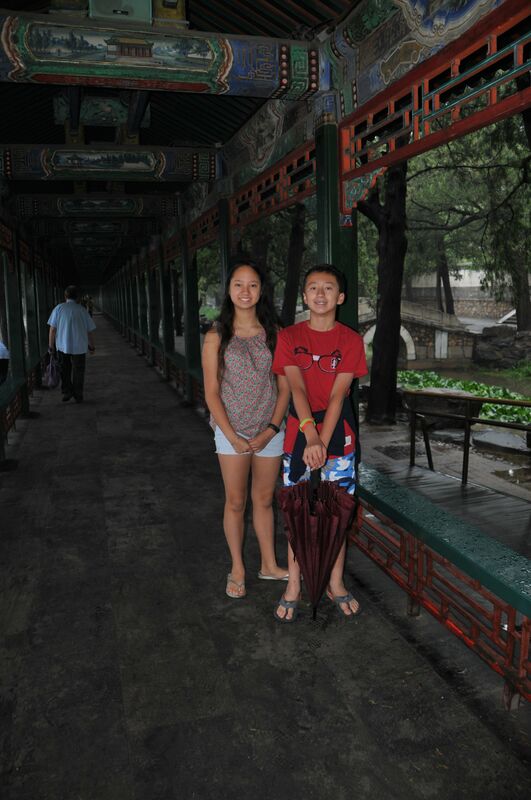 We went with family friends and since it was their first trip to Beijing, we played tourist. This process was helped disproportionately because our former exchange student was in Beijing at the time. She helped come up with the itinerary and arranged for tickets for many of our stops. the Great Wall (on a misty and rainy day) where we discovered that the locals had conveniently blocked off traffic to the closest parking lot to the wall and paid off the local police so that they could offer a local “guide” who thoughtfully would enable us to drive up to the closest parking lot for a small fee and lunch at their farmstead. It was an instructive lesson in the demonstration of corruption-fueled capitalism. I have never seen the Great Wall in weather conditions like this—it has usually been clear and hot when we’ve been there. While conditions were a bit wet, the fog drifting across the wall and the mountains made for stunning views. We had a private tour of the National Museum, thanks to Jim’s connection with the Freer-Sackler. I am not certain the rhinoceros was the most impressive thing that we saw during the tour, but it clearly captured the boy’s fancy. the most amazing item at the National Museum? The Forbidden City was also a mandatory stop. inside or outside the urn? They have now opened up the balcony where Mao made his famous speech declaring the formation of the People’s Republic of China while overlooking Tiananmen Square. (No further comment.) The views of the square are stunning. We had a fabulous trip, and it was way fun to play tourist after several years of not getting back to China. Our daughter came up with the headline for this post, and it perfectly captures the highlights of our recent trip to China and Hawaii. 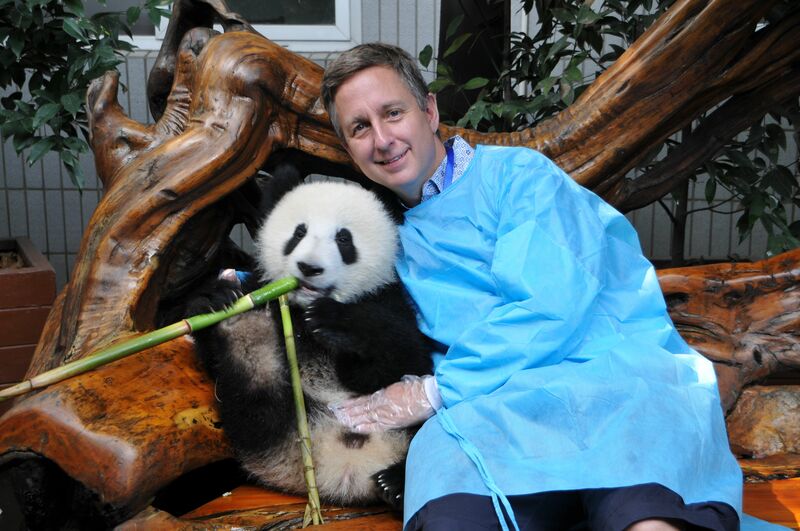 We started off in Beijing for a day or so, but, really, the focus of this trip was Chengdu and the Panda Breeding and Research Center. 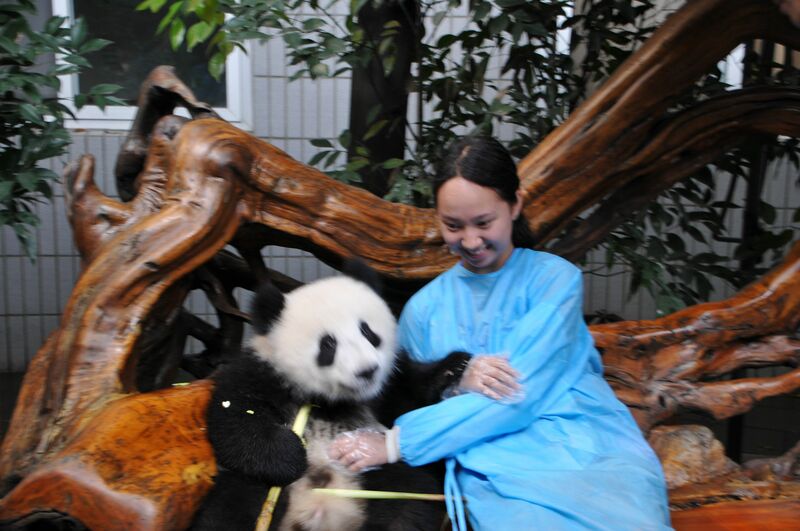 And the focus of the visit to the Panda Breeding and Research Center was to hold a real-live baby panda! 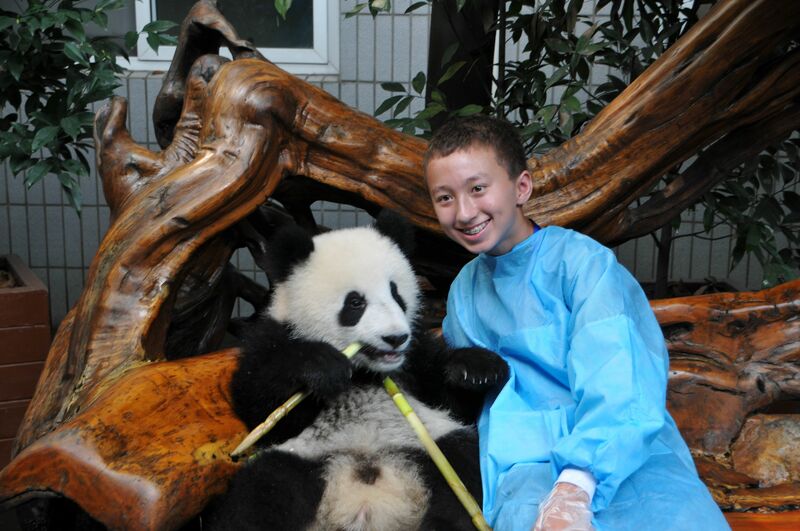 As you can see from the photos, the panda cub was about 10 months old and roughly 50 pounds. 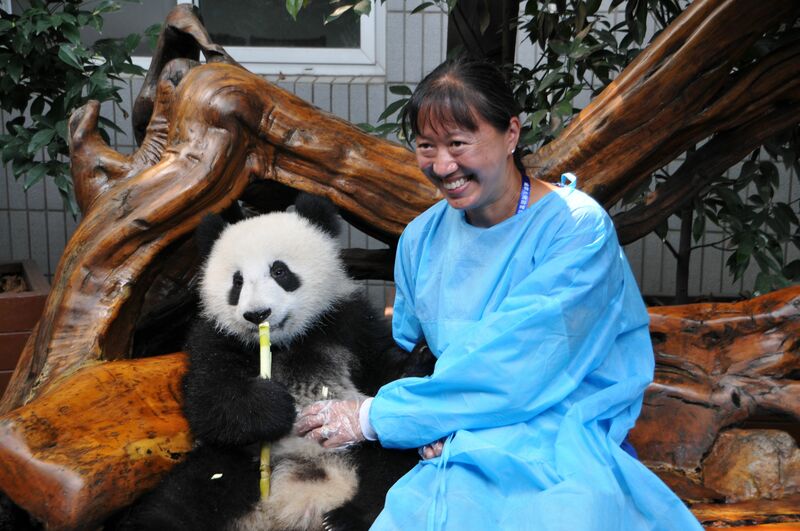 (Any bigger and the experience would be problematic, as pandas play rough.) The panda cub is eating bamboo coated with honey, which is in large part responsible for its mellow and beatific behavior. All of us wore booties over our shoes and giant blue smocks. The Center was great about time spent with the panda cub, with plenty of time to pet the panda (although we were instructed not to pet the face or ears) and the ability to take plenty of photos. 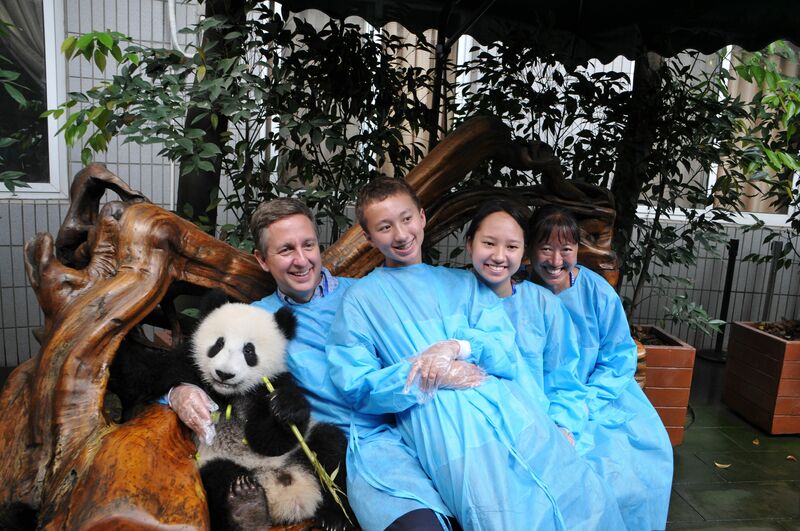 the family with a baby panda! Meeting the panda cub was such a highlight that our stay in the Aman Hotel, with its secret door to the Summer Palace (my favorite place in Beijing) that allows you to visit the Summer Palace before opening hours was a distant second in trip highlights (a distant third if you count the Hawaii portion). But, despite that, here’s the Long Corridor in the Summer Palace with NO people (unheard of in a city of 15 million people). With respect to the Hawaii portion of our trip, thanks to a friend of ours who is a naval officer, we were able to tour the USS Olympia, a Los Angeles-class fast attack nuclear-powered submarine. We weren’t able to take photos due to security concerns, but to be able to tour the sub was awesomely cool. We were obviously not allowed near the nuclear reactor or the engine room, but we toured the control room and the rest of the sub. For those who are wondering, there are five (!) bathrooms for the approximately 120 folks aboard the sub. The torpedoes are 4,000 pounds each and are transported to the torpedo tubes using a hydraulic system. It is an incredible feat of design and engineering. And submariners have to be a bit crazy—you certainly can’t mind small enclosed spaces, and you certainly have to be comfortable always being surrounded by people (introverts need not apply). Added to that was an admiral boat’s tour of Pearl Harbor, surfing lessons every day for the kids, and shave ice at Uncle Clay’s House of Pure Aloha (and meals at Town, Chef Mavro, and Alan Wong’s). Honolulu was pretty perfect. All in all, a great addition to the family vacation memory book!